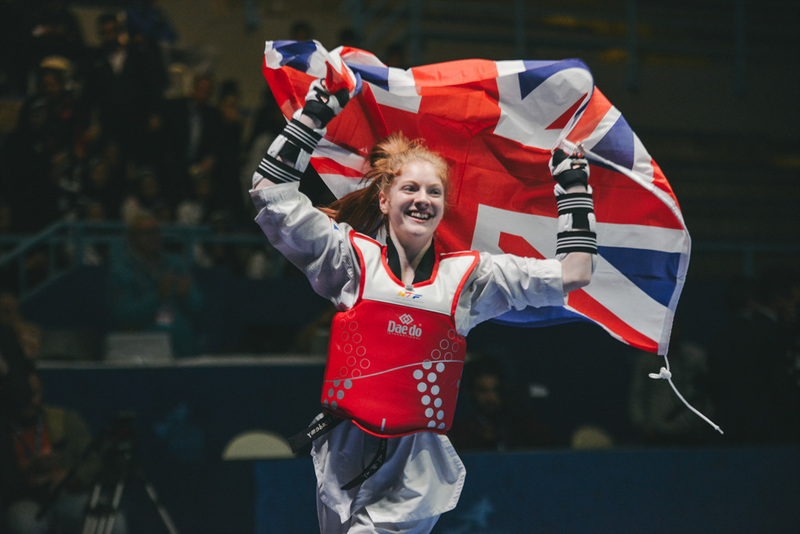 HAMMAMET, Tunisia (April 9, 2018) – The World Taekwondo Junior Championships began in spectacular fashion today in Hammamet, Tunisia with Korea winning two gold medals and Iran and Great Britain winning one gold each on a day of fast-paced and exciting action. Over the course of the five-day competition almost 1,000 athletes from a record 118 countries will compete across 10 male and 10 female weight categories. To be eligible, an athlete must be born between 1 January 2001 and 31 December 2003. 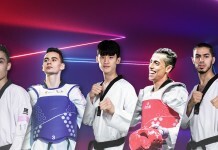 Mi-Reu Kang of Korea won gold in the Juniors Women -42kg, Hossein Lotfi from Iran claimed gold in the Juniors Men -45kg, Jordyn Smith of Great Britain won gold in the Juniors Women -44kg and Korea’s Jin-Ho Kim won gold in the Juniors Men -48kg. The women -42kg final was contested by Kang and Turkey’s Emine Gogebakan. Gogebakan started the round strongly landing three body kicks in quick succession giving her an early 6-0 lead. However, Kang fought back to take a 7-6 lead, before landing a series of kicks to the trunk protector in the final 30 seconds. Kang finished the round 17-6 up. In the second round, Kang started where she left off. She continued to attack on the front foot and landed a flurry of kicks. Gogebakan fought back valiantly but Kang proved too strong and extended her lead to 20 points just before the end of the second round to win the gold medal. The match finished 30-10. The bronze medals were won by Larisa Medvedeva of Russia and Mobina Kalivand from Iran. The second of the day’s finals saw Lotfi face Amirbek Turaev from Uzbekistan. The final got off to a frantic start with Lotfi landing a head kick within the first five seconds of the match. He landed a body kick moments later but was pegged back with a gam-jeom. As both fighters went on the attack and attempted to find an opening, it was Lotfi who landed another head shot and a number of body kicks to end the first round 12-2. In the second round both fighters defended ably and it was not until there was 30 seconds remaining that the first score of the round was made as Turaev received a gam-jeom for stepping out the octagon. With little more than 10 seconds remaining it looked like the match was headed for a third round, but Lotfi finished by landing two excellent head kicks and a kick to the trunk protector to take the score to 23-2. Lotfi therefore took the gold medal courtesy of securing a 20 point lead. The bronze medals were won by India’s Kanha Mainali and Jang-hoe Lee from Korea. The Juniors Women -44kg category saw Smith go up against Thailand’s Jongkolrattanawattana. Neither fighter wanted to give anything away in the opening exchanges with both defending well. The opening round finished 0-0. Both fighters came out quickly in the second round hoping to land the first point. Smith was successful in forcing Jongkolrattanawattana out the octagon giving her a 1-0 lead. But Jongkolrattanawattana fought back instantly with a front kick to the trunk protector only to give away a point through a gam-jeom. The score remained 2-2 for much of the round before Smith executed an excellent head kick and body kick combination to go 7-2 up. A final gam-jeom gave her a second round lead of 8-2. In the final round, Smith extended her lead to 19-2. Jongkolrattanawattana increased the intensity of her attack and landed a number of successful scores to reduce the gap, but ultimately it was too big a lead to overcome and Smith won 22-13. The bronze medals were shared by Anastasiia Artamonova from Russia and Lena Stojkovic from Croatia. The last final of the day was fought between Polat and Kim. Neither fighter was able to score in the opening exchanges, but with 30 seconds remaining Kim landed a perfectly timed punch. A gam-jeom doubled Kim’s lead. In the second round, Kim once again used the punch to good effect and went 6-0 up with a kick to the trunk protector and gam-jeom. In the final round Polat continued to attempt to break down Kim’s resolute defence but Kim proved too elusive and the match finished 10-0. Dmitri Shishko of Russia and Thailand’s Peerakit Tharanantaseth shared the bronze medals.